I was sitting in my easy chair drinking a cup of coffee and reading the morning paper. It was early April, 2000 and the wind was blowing a rain and snow mixture on my window when my phone rang. It was my hunting buddy, Marshall, of whom I had hunted with nearly thirty-five years. He simply said, "Get your stuff together; we are going to Africa in May." My initial response was I have no desire to go to Africa and furthermore, why Africa? My thoughts also confirmed that I did not have a current passport and the main issue was I could not afford it. His response to my remarks were "My wife cancelled out on our trip to Africa, I have the tickets, the hunt is booked and paid for, and it's not going to cost you anything." I almost choked on my last swallow of coffee as I was totally flabbergasted and I really think I was in what I call a state of shock. I briefly talked it over with my wife, who is known for her extreme understanding of my ways, and she said, "Go for it." I wasn't going to waste a minute of time and I knew the first thing I had to do was get a passport and after contacting the passport agency they would fast track it for me for a fee. I overnight mailed my application and photo and had a passport in less than ten days. I shopped for clothes I needed, packed my gear and was on my way to Spokane International Airport on the 12th of May. Marshall and I flew to Atlanta, Georgia, spent the night and flew from Atlanta to Johannesburg, South Africa the next day. After a very long flight in which I wondered why in the world I had agreed to this punishment, we arrived at 8:30 in the morning in South Africa. We cleared customs and met Alan Korzman. He took us to a Bed and Breakfast and made sure we were squared away. It was about 11:00 in the morning when he asked if we had any preference as to what we wanted to do the rest of the day. We asked him if he had some ideas and he said, "Shopping or I can take you on a short hunt." It would come as no surprise that we decided to go to a farm for an afternoon hunt, but not before we had a real nice lunch and a cold beer. The farmer and his wife were especially nice to us and wanted us to stay there but we had already booked other plans. We checked Marshall's 30-06 rifle and then went out hunting. 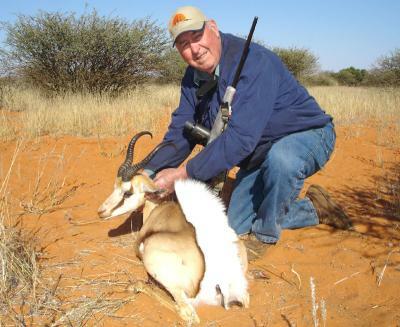 It was not very long before Marshall made a very good shot on a Blesbuck and then we rode around in the Safari car and scouted the varied assortment of animals. There were a lot of Springbuck and as we were looking at a couple of nice rams, Alan said, "John if you want one of those rams use Marshall's rifle". I had not intended on shooting any game as I went along only as an observer. To make a long story short, not only was I an observer, but I had a nice ram after a short stalk. Let me tell you: this is where I made my life changing mistake. I was forever hooked. As I am writing this I can look up and see the ram on my wall and the memories come back as if it all took place yesterday. We went back to the farm house, took care of our parched throats by having a cold drink and sharing stories and then headed back to Johannesburg. We stopped to eat at a nice restaurant and I had a wonderful Zebra steak for dinner. This, for me, was living the good life and one more reason to be in Africa. We spent a comfortable night at the Bed and Breakfast and as we were eating breakfast the next morning, Alan joined us and we loaded our gear and headed for Grand Central Airport where we hopped into a Piper Seneca and flew out for Zimbabwe. We made a short stop at Petersburg to clear customs and then flew on to Buffalo Range Airport at Cheridzi, Zimbabwe where Gary (our professional hunter for the next 14 days) was waiting for us. This was when I met Gary and I liked him right away as his very first comment to Marshall was, "See you brought you wife after all." We all had a good laugh and I started feeling at home. By this time I was completely enthralled with Africa and as my feelings kept growing for this place, I was glad that I took Marshall's generous offer to join him. on the river, enjoyed our favorite beverage and listened to stories that were shared to never be forgotten, even years after they had been told. Gary made sure we were settled in and informed us that if we are going to shoot a leopard we would have to put out bait. Marshall and I shot two or three impala each and we hung bait in five different spots and went back to the lodge and sat around the fire and dreamt up our own stories over cold Zambezi beer. After another wonderful meal we all went to bed and listened to animals off and on all night getting ready for the big hunt in the morning. Very early the next morning I was awakened by a black man named Seven who brought me a hot cup of coffee. I had a quick, hot shower and then off to breakfast as we were getting ready to head out with Gary and the two trackers, Shumba and Jimmy to check the bait we had set. We found that we didn't have any "leopard action" so we scouted Buffalo as Marshall wanted a big bull. Game was everywhere you looked and there was sign of buffalo but we did not get a chance at one that day. We did track an old lone bull, but Gary said we could do better than that, so we let him go. We kept driving and on our way we took a couple more Impala. Marshall mounted on of them as a trophy because it was so impressive. We stalked a zebra but he spotted us and ran off so we decided to go back to the lodge for lunch and a siesta so as to prepare to go back out around 3:30 that day. Seven woke me and told me that tea and biscuits were being served and then we went out hunting. There was a herd of buffalo and much more game including a bull elephant standing in the middle of the road. He wasn't interested in moving but what a sight to see and just looking at him made me glad that I decided to go to Africa. Where else could anyone experience a sight like that? The next morning we were out early checking bait and the very last bait we checked a leopard had fed and eaten most of the impala. Gary said by the tracks it was a large male and we came back later in the day to build a blind. I was amazed at the detail and skill that they had put into building the blind. Marshall and Gary went back out to the blind at 4:30 in the afternoon to wait for the leopard. We were back at camp enjoying ourselves when Shumba got a call on the radio about 6:45. Gary wanted some lights and said Marshall had shot a leopard but they did not know the outcome yet. We arrived at the blind with great anticipation and brought the lights. After a short while of looking for the leopard, it was found shot in the heart. The leopard ranked in the top 40 SCI. What a celebration this was for everyone. I could go on and on about this trip so I am going to shorten my experiences and only continue by writing the most important parts of the trip that remain in my memory. We took, in addition to the animals I have already mentioned, Cape buffalo with 42 inch horns, 17 3/4 inch boss. I shot a nice Zebra and I took a trophy Impala. Marshall took a nice Zebra stallion and a very nice Kudu bull, a real Warthog, Civet cat and also a Jennet cat. We had a wonderful time everyday and I did not want it to ever end, but we all know that good things do come to an end. We got our charter back to Johannesburg and our flight home. The flight home was not as long and difficult as the trip over, maybe because this was a trip of a lifetime and the excitement had not ended for me. For someone who did not want to go to Africa, this trip set me up for another hunt with Gary and I have been to Namibia three times. I want to tell you I have never in my whole life of seventy-five years ever met more God fearing and wonderful people than in Africa. May the sun shine on them all and God bless them in their lives. The only way to end this story is to say: "WHY NOT AFRICA?" because it has changed my life. I have not only had the great opportunity to hunt with my best friend Marshall, meet some of the most wonderful people in the world, but experience wildlife that cannot be matched anywhere. I can also say that if Marshall's wife ever needs to cancel out again, he can always count on me as I do not mind the razzing, I have kept my passport current to again and I am not finished making stories of my own. I've been to John's house, seen the mount and a million photos. This is a true story from the heart. Thanks for sharing this John. I really like the picture of the SPRINGBOK. It is a very unusual animal. The horns hook back rather than go up and hook toward each other.The story is also wonderful and well written. I know John and Marshall and I wish I had been on soom of the trips these two have taken.I know one of there favorite P H and he thinks the world of them both. AFTER READING THIS STORY I NOW NO WHY AFRICA.I AM GOING TO GO SOMEHOW I MIGHT HAVE TO TOP OUT MY CREDIT CARD.A TRULY GREAT STORY. Thank you for your excellent story. The description of your long lasting friendship with Marshall was touching and the way that you live your life to the fullest is a fine example for everyone. I lost my wife a number of years ago to cancer. Ever since then I have been trying to live my life to the fullest with Jesus's blessing and with the means available to me. I am journeying to the Kalahari in May of 2009. Maybe I'll see you there and we can hunt Springbok together. I hunted with John in Namibia in 2002 we had a great hunt. He is a great person to be around and a great hunter. He did a great job on this story. Now I REALLY wish I could go back...soon! Written just like it was (and still is, I'm sure). Thanks for renewing my memories and wishlist! Honest, sincere tell-it-like-it-is. Great description if someone wanted the truth! You sure put your story together wonderfully. I have been there and you wrote it as it is. GREAT STORY, lots of feeling. Makes me want to go back to Africa again soon! You sure tell a great story John. I felt like I was there with you...maybe a new career as a writer? Thanks for sharing your experience and I am looking forward to the next story. Your story has inspired me to go to Africa and experience all that it has to offer. You have written an excellent story. Being the "other guy" in the story what can I say? When you get the sand in your shoes it's hard to get it out. John and I have had a great ride over the last 40 years with stories that I wouldn't believe, and some people don't, but I was there. This is such a great story, not only about hunting in Africa, but about a friendship that opened up a new world and changed a life. Great job and thanks for sharing it with us! A very emotional story about a wonderful experience. It is nice to have friends. I have been to Afica once also and the people are extraordinarily self sufficient, family oriented, and friendly. John captured the African experience. A VERY WELL WRITTEN STORY. LOTS OF FEELING! MAKES YOU FEEL LIKE YOU ARE THERE. We all can sit around and say "Why Africa?" or we can do like John Mac Donald and live life to the fullest. Way to go John, hope you have many more trips like that one. Your story was more than just the hunt. It was the entire experience! Thank you for sharing your story with all of us, it's like we were all there with you. What an experience. What a story! WONDERFUL! I did not know my OPA was so talented! A wonderful story. Very strong feeling in it.